Lastnight, after we put the boys to bed, Darcy and I had a little sweet craving. I had exactly the right ingredients to make Fudge. I never use to really care for fudge until I had some of my mother-in-law's. 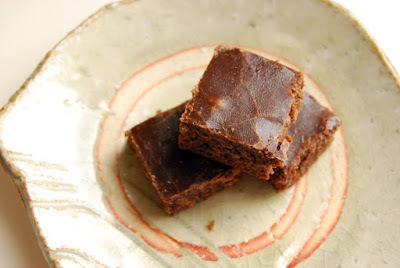 She makes delicious fudge and this is the delicious recipe which is really easy. Place all the ingredients above in a non-stick pan or pot. Slowly bring to a boil, stirring occasionally. Boil no more then 5 minutes and remove from heat. Pour into a 9x9 greased pan. Let cool and then cut into squares. Delicious with a nice, cup of warm herbal tea. This recipe is exactly the same as the recipe my Mom would make us when we were kids. It came from a local recipe book my Mom was selling for the alumni at the hospital she once worked in as a nurse in the 1970's. I just made a pan and I am waiting for them to cool. A quick sweet treat...I added walnuts to my recipe but the recipe is nice without nuts too! Super easy to make!